I recently asked writer Tom Bissell whether voice actors might ever become celebrities in the video game world. I wondered whether they would ever be featured as headliners who could single-handedly amplify sales and excite major curiosity. "Unless every game uses the immensely expensive and complicated processes Team Bondi and Rockstar Games employed in L.A. Noire, there's only so much a voice actor can do with his or her in-game performance," he told me. "A voice actor can hit all the right emotional notes, but the gestures and facial inflections and other performative tics we expect from a live-action performer are pretty much impossible to capture outside of Pixar- or Disney-style animation." "The kinds of big, bold, emotional storytelling moments that traditional, authored drama lives by—and that actors live to perform—doesn't have an obvious place in video games. Not even in L.A. Noire, whose focus was storytelling. That's the giveaway, I think. The video game is not an actor's medium and it's not a writer's medium, though getting talented actors and writers can certainly make for better games. But acting is probably never going to be the point of games." Crucial, but subordinate; powerful, but not the point, voice acting is one of the most unexplored and unexamined tools in the game developer's arsenal. It's now being examined by Bissell, a writer of fiction, memoir and journalism, including Extra Lives: Why Video Games Matter, who has lately brought a refreshing intelligence and rigor to discussions of games—particularly how they operate (or fail to operate) as storytelling vehicles. Bissell is profiling voice actor Jennifer Hale for an upcoming issue of The New Yorker. "Acting is probably never going to be the point of games." Hale is one of the top voice actors in video games. She is well-known and well-loved by many gamers, particularly for her role as the female incarnation of Mass Effect series protagonist Commander Shepard. She is a voice actress of unique ability and emphasis; the success of her performance as Shepard can be summed up by the feeling that we can influence—but never absolutely control—the character she has created. Fan enthusiasm for Hale's performance has been ardent enough to convince BioWare to feature female Shepard, for the first time, in both a trailer and on the box art for Mass Effect 3. Bissell was wowed by Hale's work and her process, but he still can't say acting can be seen as the point, as the focus, of video games. He has a hard time seeing the voice-actor as the star and acting as the element that sells a game. Granted, one could argue that acting had not always been the point of the movies. One of the most widely circulated tales of the silent film era is that of "the Biograph Girl," an icon considered by many historians and cinema buffs to be the first-ever movie star. Biograph Studios did what all other film studios at the beginning of the century did: they kept the names and personal histories of their actors anonymous to the cinema-going public. When audiences and exhibitors developed an ongoing interest in a particular performer, they invented names of their own: "the Biograph Girl," "the Vitagraph Girl," "America's Sweetheart." Early film studios had a reason for their secrecy. An anonymous, nameless actor couldn't (by industry logic) demand higher wages or billing. The salaries of pioneering film performers were irregular, uncertain and entirely measly, when compared to the capital raked in by the mega-stars of the 1920s. Before they were given credit for being objects of great importance—and in many instances, all-importance—film actors were in no way distinguished by their salaries from other contributors to the filmmaking process. Game development is even more technical, more collaborative, more spread out across an even greater number of specializations than filmmaking, Bissell observed. That limits the significance of the voice actor. "Developers are doing all the front-end work and all the back-end work and all the other work. There's very little that makes a video-game voice actor absolutely essential to the process. They all know that, I suspect." The actors and actresses of yesteryear had no official agencies or mechanisms through which their salaries could be mediated: there was no actors' union in 1909. There are now, and video game voice actors can be members. In expressing his ambivalence to The New York Times over his income from Rockstar's colossally successful Grand Theft Auto IV, actor Michael Hollick—the voice and gesture of protagonist Niko Bellic—laid the blame for his remunerative dissatisfaction at the feet, not of Rockstar, but of his union "for not having the agreements in place to protect the creative people who drive the sales of...games." I asked Bissell whether he had encountered any comparable uneasiness or resentment in the actors he spoke with for his New Yorker piece. "I think Hale and [Uncharted series lead actor Nolan] North and most other steadily-working voice actors feel lucky to get to do relatively high-profile and relatively lucrative work that doesn't require that much physical, emotional, or travel wear and tear. As Jennifer told me, when I tried to suss her out over the pretty galling (from my perspective) fact that you can be paid $1500 to perform in a game that makes $200 million, she goes in for a few hours, and she's done. Every voice actor I spoke to stressed, I think genuinely, how generally pleasurable the work is and how generally happy they are to do it." Bissell was skeptical that we'll reach a gaming moment parallel to that experienced by silent film in the early 1900s—when audiences became obsessed with screen actors, and star magnetism dictated ticket sales. 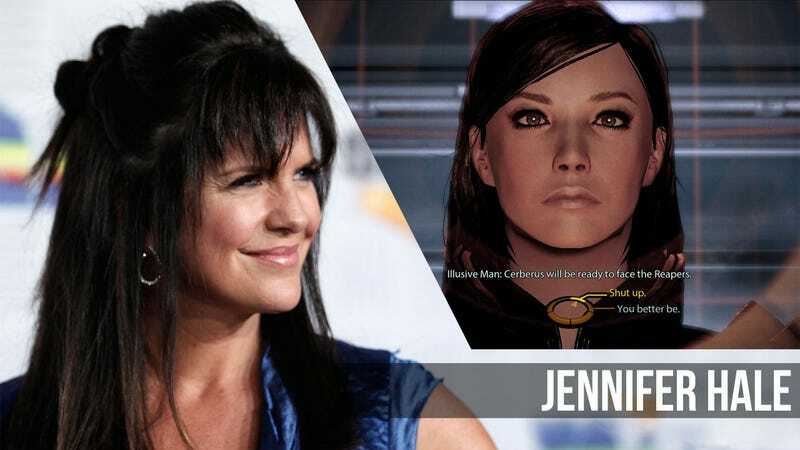 "I can say that if I hear Jennifer Hale is performing in a game, my chances of being interested in that game increase by about 30 percent," he said. "So I think some of us out there are already interested enough that we follow who's doing what for whom. Whether this will happen on a much wider scale, I dunno. I sort of doubt it." While the video game industry can't boast too many homegrown celebrities, it has been no stranger to borrowing them from the stage and the screen—a practice that isn't clearly worth the money. Wouldn't Liam Neeson's salary for his cameo in Fallout 3 have been better spent on populating the remaining countless hours of that game with more, better voices? Bissell agreed that there have been some infelicitous—and even wasteful—star appearances in recent titles. "Patrick Stewart's performance in the last Castlevania game was just hilarious. He sounded, half the time, close to suicide. No one who's done as much Shakespeare as Stewart should be asked to recite such garbage." The developers of Castlevania: Lords of Shadow may have been aware (on some level) that their dialogue was shoddy. It was ranged across loading screens and players had the option to skip much of it. "Paying Patrick Stewart to waste his time and talent on something gamers are allowed to skip makes no sense to me. None." The industry is aware of its past misdemeanors, Bissell believes, and is acquiring discretion. "I think developers have figured out that a star for the sake of having a star is neither artistically provident nor financially viable," Bissell said. Casting stars can work. Some successful performances, according to Bissell, are Stephen Merchant for Portal 2 and Andy Serkis for Enslaved: Odyssey to the West, both well worth the expense. Assessing the quality and significance of voice work in video games is difficult. The actors, who record most of their work in sound booths, have to rely more upon intonation and simulated feeling. The performances in games are at odds with our modern enthusiasm for method-style acting. They're not in the world of their character. There's no set. During a recording session for the third Mass Effect title, Bissell observed Hale perform with hardly any context, any background, and only the merest catalog of motives and associations—she relied primarily upon the strength of in-in-the-moment actorly affectation. These are performances that, according to Bissell, are "practically speaking, bluffed and extrapolated." Bissell was amazed by Hale's Mass Effect 3 work. "Acting requires an incredible amount of focus and energy, and it's so much harder to generate that focus and energy when you're alone and the story you're bringing to life is completely abstract to you. That the performances in BioWare games are as good as they are is even more impressive to me now that I know how much harder it is for the actors to connect to the material in BioWare games." The labyrinthine substructure of these narrative-heavy games, in which player choice must, almost by definition, be taken into account, force BioWare to handle voice-acting as they do, isolating actors and having them read reams of lines. "There's no other way for BioWare to do it," said Bissell, "unless you can figure out a way to record a 100 actors doing complicated, branching performances at the same time. The less linear the game, the harder it is on the quality of the performances." My instinct as a gamer has been to want to elevate the perceived importance of voice actors, to see them as stars. I've watched featurettes depicting how Naughty Dog has encouraged the actors of Uncharted to improvise, and of the closeness with which they associate motion-capturing with audio. I've been impressed (and made uneasy) by footage of the actors of L.A. Noire sitting pin-straight and motionless, surrounded by a phalanx of MotionScan cameras. And yet, after speaking with Bissell, the accomplishments of these studios has appeared shallower, less noteworthy. Tightly-scripted and frequently linear, those games are like films. One "take" that fits the one way a given scene can unfold will find its way into the final build of the game. That type of voice-acting bypasses that tricky issues of player participation altogether. This is film acting, not game-specific acting. In the actor of the stage and of the screen we desire personality, and even ego. But Bissell's take on Hale, and on the video game voice-acting business as an organism, celebrates a different kind of desire: a desire for the actor's obscurity. Indeed, the point of games has always been the player. That is the person who matters most. Our lack of curiosity for the woman voicing the Commander, or the man behind the thug, might be the very sign that these voice actors are doing something right. Quietly and selflessly, behind a drawn curtain, they've make us believe that we who hold the controller are the ones running the show. Tom Bissell's profile of Hale, "The Invisible Girl," is scheduled to run in The New Yorker's later this summer. Stay tuned with the magazine's website for more details.